Clubfoot is the most common congenital deformity of lower limbs. Its etiology remains an enigma. The aim of the treatment is to obtain a plantigrate, painless and functional foot. Conservative treatment with Ponseti method of clubfoot is well-accepted and has been reported to result in good correction ranging from as low as 50% to as high as 90%. Surgical treatment is indicated only after failure of conservative methods, with limited release also known as " a la carte"release. This review looks at etiology, clinical assessment, scoring and provides an overview of operative and non-operative treatment options. Clubfoot or Congenital talipes equino varus (CTEV) was introduced in the medical literature by Hippocrates around 300 B.C. The incidence of CTEV is 1-2 per thousand live births. The involvement is bilateral in about 50% of cases and in unilateral cases the right side is affected slightly more common than left. Idiopathic clubfoot is approximately twice as common in males as in females. Clubfoot is an obvious deformity easily recognized. It has four components: Equius, midfoot cavus, forefoot adduction and hindfoot varus. It is astonishing that in spite of the vast attention paid to it, there is still much uncertainty about its etiology and no consensus has been reached on methods of assessment and treatment. Current treatment of clubfoot deformity consists of initial trials of manipulation and serial casting. 30-50% feet treated in this way eventually need surgical correction. An average of 25% of the operated feet will have poor results and will need secondary surgical intervention. The aim of the review is to provide an overview of clubfoot. Clubfoot may be associated with other congenital abnormalities but is usually an isolated finding which is idiopathic in nature. Multiple theories have been proposed to explain its etiology. Radiographs are indicated in talipes equinovarus to assess the degree of subluxation of the talocalcaneonavicular joint and the severity of the deformity before commencing treatment; to provide an accurate guide to progress during the course of closed non-operative treatment; to ascertain whether reduction of the talocalneaneonavicular dislocation and normal articular alignment have been achieved; to analyze the composite deformities preoperatively and to plan operative treatment accordingly; to determine intraoperatively whether concentric reduction of the talocalneanonavicular joint has been achieved; and to ascertain postoperatively whether normal articular alignment is being maintained. Beatson and Pearson described the application of talocalcanial-index as a reliable tool for assessing correction at the end of the primary course of treatment, more in those cases in which correction was inadequate. When the deformity in the hind foot is corrected the anterior end of the calcaneus swings laterally and upwards and resumes a more normal relationship with the talus. This increases the talo-calcaneal index. If this index moves into the normal range the deformity is corrected and will not recur. If it remains below this range, although in most instances the condition is improved, it is not adequately corrected and further treatment is advisable. 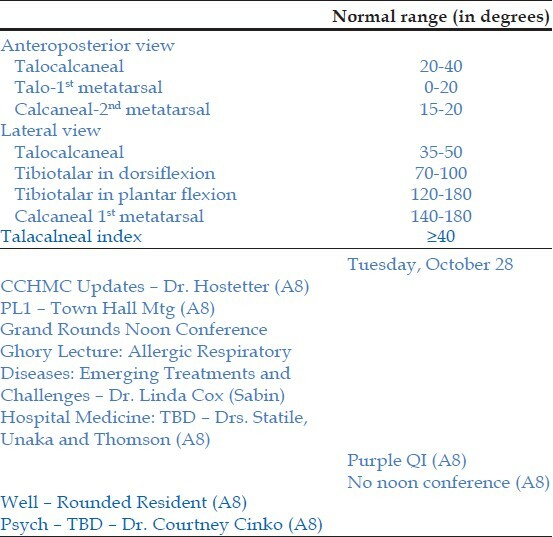 If the talocalcanial index be less than 40 degrees even though clinically the foot appears corrected-further treatment should immediately be undertaken. In the literature, numerous angle measurements for assessing talipes equinovarus have been described and the ranges of which vary among authors. The normal ranges according to Simons are  [Table 2]. The aim of the treatment is obtain a plantigrate, painless and functional foot. Every conceivable form of treatment has been recommended by various authors, tried by many at different times with varying success rates. Hippocrates (300 BC) said about clubfoot treatment that what could be done without force, could be done without harm. Bensahel et al., (1980) in France treated clubfoot by well-trained physiotherapist with daily manipulations of foot for three months, followed by taping of leg and foot to a splint. Physiotherapy softens the tissues making the foot more compliant. Ponseti argued that this style of repeated mobilization of displaced tarsal joint through physiotherapy will not reshape the foot as compare to what immobilization in proper position does. Moreover his method was lengthy and expensive and failed to correct more than one-fourth cases. Metaizeau  treated 37 clubfeet with a continuous passive movement (CPM) machine rather than by surgical release and founded that CPM treatment improved equinus and varus in all cases and thus can eliminate the need for surgery in mild clubfeet, and delay surgery in more severe cases. The first recorded use of plaster casts is that by Guerin in 1836. Kite introduced the wedge plaster cast method. ,, He corrected the deformity by slow conservative manipulation without anesthesia and then applying a long leg corrected position. A wedge of plaster directed dorsolaterally was removed and the foot abducted to close the wedge. Once the adduction and inversion were corrected he removed a wedge from dorsal aspect of ankle and corrected the equinus. Later he realized that when a cast is wedged in abduction only forefoot is corrected and switched to change of plaster every time baby comes to correct both adduction and equinus. He continued the meticulous clubfoot cast application and molding correcting each component of the deformity separately instead of simultaneously. He was able to correct the cavus and to avoid foot pronation, but correcting the heel varus took many casts. He recommended getting all the correction by abducting the foot at the midtarsal joint with the thumb pressing on the lateral side of the foot near the calcaneocuboid joint. However, by abducting the forefoot against pressure at the calcaneocuboid joint the abduction of the calcaneus is blocked thereby interfering with the correction of the heel varus. Therefore, it took many months and cast changes to slowly correct the heel varus and obtain a plantigrade foot. Ignacio V. Ponseti (1963) described his method of cast application for conservative management of clubfoot. According to Ponseti, all components must be corrected simultaneously but for equinus which takes place at ankle joint must be corrected last. Cavus is corrected first by supinating the forefoot with direct pressure under the first metatarsal. In majority of cases the cavus component is usually corrected by one cast. The hindfoot varus, fore foot adduction are then simultaneously corrected in the manipulation. The calcaneus cannot be everted unless it is abducted. Ponseti maintained the foot in cast for 5-7 days and the deformity can be gradually corrected with further manipulations in 5-6 casts. Later in 1980 in a long term follow-up of 10-25 year he published the functional results in which he found 89% satisfactory results by people treated with his plaster technique. Today multiple studies from different centers around the world have shown the effectiveness of this method with low revision and complication rates. ,,, However this method requires 2-4 years of intensive follow-up. Non compliance with the brace is a common problem and frequently lead to relapse. To avoid this problem a new dynamic foot abduction orthosis is increasingly prefeered over Dennis brown foot abduction brace. In developing countries steenbeek brace is popular, since it is cheap and has shown equally good results. The patient characteristics at the time of presentation, such as the severity of the initial clubfeet deformity, previous treatment and the age at the initiation of treatment are important factors which predict the outcome after use of the Ponseti method for the treatment of idiopathic clubfeet. Turco  (1971) performed a one stage posterior medial soft tissue release with internal fixation of talonavicular joint with a percutaneous Kirschner wire. He later in 1979 concluded that the best result of his operation was in age-group of 1-3 year. Mckay advocated a more radial circumferential soft tissue release on medial, lateral, posterior and planar aspect of foot at an early age to obtain good results. , The Cincinnati incision affords excellent exposure both posterolaterally and posteromedially. However, skin closure at the conclusion of surgery at times is difficult. Use of soft tissue expander before operation for clubfoot may help in primary skin closure after surgery for clubfoot in children would be difficult. They are especially helpful before extensive surgery for clubfoot especially in revision procedures and for older children. The 'Complete Subtalar Release consisted of a standard posteromedial release with additional release of the talonavicular joint, the calcaneofibular joint and the interosseus ligament. A greater degree of correction is obtained with the Complete Subtalar Release (both clinically and radiologically), superior alignment of the foot and knee is achieved, and the incidence of complication is no greater. The Complete Subtalar Release produced significantly greater correction of the angles that were used to measure equinus and varus angulation and talonvicular subluxation. With this procedure there is tendency to over correction unless the bones were precisely repositioned at the end of the procedure. The procedure is indicated when the foot is at least 8 cm long, the patient is at less than 4-years-old, and there is talonavicular subluxation or varus deformity or both, that has resisted non operative treatment. Contraindications include flat top talus and severly restricted planter flexion due to contracture of the ankle. Relative contra indications include rocker bottom deformity and marked pes planus. In general, bony procedures are rarely if ever, indicated in the infant and young child as these will disturb the normal growth and development of the foot. In a skeletally mature foot (more than ten years old), osteotomy of the os calcis, tarsal reconstruction and triple arthrodesis are required as salvage procedures. Metatarsal osteotomy at their bases will correct the varus footfoot, Dwyers osteotomy of the calcaneus corrects hindfoot varus and medial rotation osteotomy of the tibia may be indicated to correct severe lateral rotational malalignment of the tibia and fibula. , Occasionally, a talectomy is performed. Even with surgical management, some foot are either resistant to correction or relapse. This may require repeated surgery in about 20% of cases. Repeated surgery may cause small, stiff and painful foot. External fixators are very useful in such cases. This method added a new dimension to the ability to solve 3 dimensional problems previously more difficult or less safe with conventional technique. Grill and Frankie used Ilizarov fixator for treating relapsed or neglected clubfoot. They achieved plantigrade foot with satisfactory clinical and radiological results in all 10 feet treated. Gupta and Bither used Ilizarov fixator in treating 15 patients (16 feet), achieving plantigrade foot in all except one with good or excellent appearance at follows up. They supported the use of iilizarov as the benefits offered outweigh the risk of associated complications, making this potentially cumbersome appartus a useful tool in the armantarium to treat relapsed clubfeet following soft tissue release. However, use of this apparatus should be reserved for children above 3 years of age. Dr. Joshi designed his J.E.S.S (Joshi's External Stabilizing System), an external fixator system for correction of deformities in clubfoot. It was based on the principle of Differential Fraction Distraction laid down by Ilizarov. 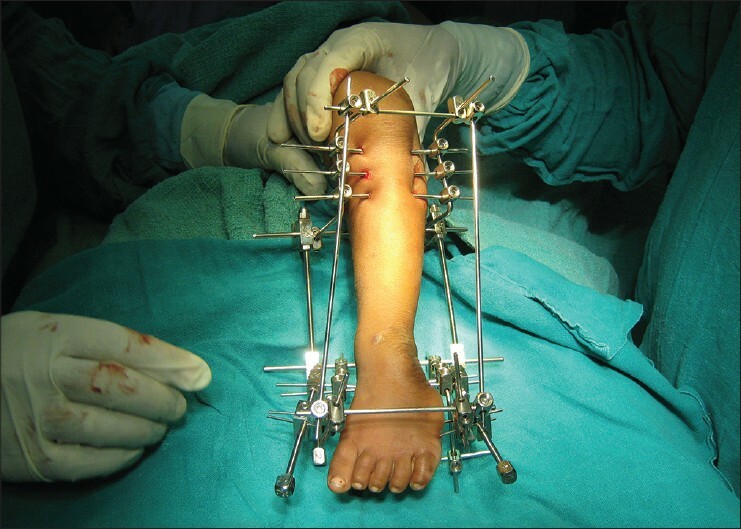 He used this fixator system successfully in all presentation of clubfoot in children aged 3 months to adulthood. Subsequently other authors have shown good result with jess fixator in deformities remain uncorrected by plaster-of-paris casts and manipulation as well as recurrent clubfoot [Figure 2]. , We also had a good experience with this fixator in resistant and neglected clubfoot and give as good result as complete subtalar release. Clubfoot is one of the frequent conditions encountered in the practice of orthopaedic surgeon. Conservative management with ponseti technique has shown excellent result and decreased the requirement of surgery drastically. Surgery should be done as " a la carte approach". Grading system is simplistic and does not adequately assess the severity. Ilizarov fixator has a definitive role in relapsed, recurrent clubfoot. Jess fixator may safely be used in small childrens (less than 3 yrs) with equally good result as Ilizarov. Wynne-Davis R. Family studies and the causes of congenital clubfoot: Talipes equinovarus, talipes calcaneal valgus, and metatarsus varus. J Bone Joint Surg Br 1964;46:445-63. Ponseti IV, Smoley EN. Congenital club foot: The results of treatment. J Bone Joint Surg Am 1963;45-A: 261-34. Grant AD, Atar AD, Lehman WB. The Ilizarov technique in correction of complex foot deformities. Clin Orthop Relat Res 1992;280:94-103. Bohm M. Pathological anatomy of Clubfoot. J Bone Joint Surg 1963;45:45-52. Brockman E. Relapsed clubfoot by Dilwyn Evan's. J Bone Joint Surg 1963;143:538-42. Ippolito E, Ponseti IV. Congenital club foot in the human fetus. A histological study. J Bone Joint Surg 1980;162:8-22. Palmer RM. The genetics of talipes equinovarus. J Bone Joint Surg Am 1964;46:542-56. Wynne-Davies R. Family studies and aetiology of clubfoot. J Med Genet 1965;2:227-32. Insley J. Syndrome associated with a deficiency of part of the long arm of chromosome. Arch Dis Child 1967;42:140-6. Irani RN, Sherman MS. The pathological anatomy of clubfoot. Clin Orthop Relat Res 1972;84:14-20. Hecht JT, Ester A, Scott A, Wise CA, Iovannisci DM, Lammer EJ, et al. NAT2 variation and idiopathic talipes equinovarus (clubfoot). Am J Med Genet A 2007;143:2285-91. Honein MA, Paulozzi LJ, Moore CA. Family history, maternal smoking, and clubfoot: An indication of a gene-environment interaction. Am J Epidemiol 2000;152:658-65. Ponseti IV, Smoley EN. Congenital clubfoot: The results of treatment. J Bone Joint Surg 1963;45:261-75. Macewen GD, Scott DJ Jr, Shands AR Jr. Follow-up survey of clubfoot treated at the Alfred I. du Pont Institute with special reference to the value of plaster therapy, instituted during earliest signs of recurrence, and the use of night splints to prevent or minimize the manifestations. JAMA 1961;175:427-30. Wynne-Davies R. Talipes equinovarus. A review of eighty-four cases after completion of treatment. J Bone Joint Surg 1964;46:464-76. Chacko V, Mathew T. Some observations in the treatment of congenital clubfoot. Indian J Orthopaedics 1976;10:127-31. Mackay DW. New concept of and approach to club foot treatment: Section II- Correction of Club Foot. J Pediatr Orthop 1983;3:10-21. McKay DW. New concept of and approach to clubfoot treatment: Section III--evaluation and results. J Pediatr Orthop 1983;3:141-8. Dimeglio A. Classification of talipes equinovarus. In: Simons GW, editor. The Clubfoot. The present and a view of the future. Springer Verlag; 1 st ed., 1994. Pirani S, Outerbridge H, Moran M, Sawatsky B. A method of evaluating virgin clubfoot with substantial interobserver reliability. POSNA (Abstract) 1995. 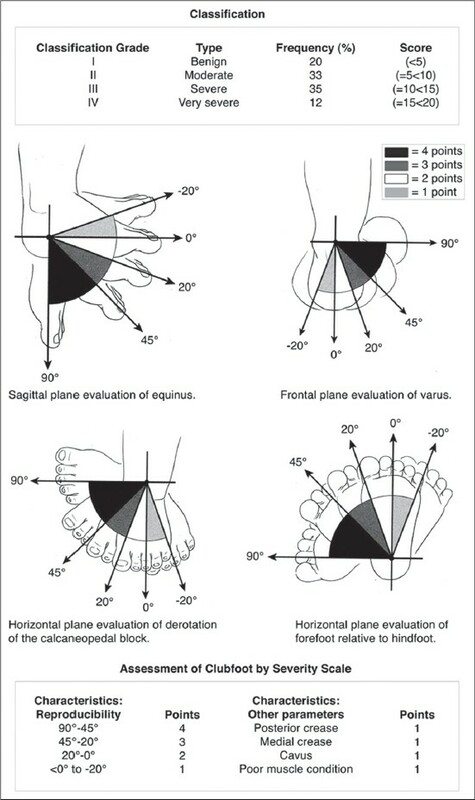 Beatson TR, Pearson JR. A method of assessing correction in club feet. J Bone Joint Surg Br 1966;48:40-50. Simons GW. A standardized method for the radiographic evaluation of clubfeet. Clin Orthop Relat Res 1978:107-18. Vanderwilde R, Staheli LT, Chew DE, Malagon V. Measurement on Radiographs of the foot in normal infants and children. J Bone Joint Surg Am 1988;70:407-15. Moses W, Allen BL Jr, Pugh LI, Stasikelis PJ. Predictive value of intraoperative clubfoot radiographs on revision rates. J Pediatr Orthop 2000;20:529-32. Joseph B, Bhatia M, Nair NS. Talo-calcaneal relationship in clubfoot. J Pediatr Orthop 2001;21:60-4. Pirani S, Zeznic L, Hodges D. Magnetic resonance imaging study of the congenital clubfoot treated with the Ponseti method. J Pediatr Orthop 2001;21:719-26. Kite JH. Non operative treatment of congenital clubfeet: A review of one hundred cases. South Med J 1930;23:337. Kite JH. Principles involved in the congenital clubfoot. J Bone Joint Surg 1939;21:595-606. Kite JH. Some suggestions on the treatment of clubfoot by casts. J Bone Joint Surg Am 1963;45-A: 406-12. Fripp AT. The relapsed club foot. Proc R Soc Med 1951;44:873-6. Reimann I. Congenital idiopathic clubfoot. Thesis. Copenhagen: Munsgaard; 1967. Ponseti IV, Somoly EN. Congenital Club Foot: The results of Treatment. J Bone Joint Surg Am 1963;45:261-344. Ponseti IV, Laavege SL. Long term results of congenital clubfoot. J Bone Joint Surg Am 1980;62:23-31. Pulak S, Swamy M. Treatment of idiopathic clubfoot by ponseti technique of manipulation and serial plaster casting and its critical evaluation. Ethiop J Health Sci 2012;22:77-84. Gupta A, Singh S, Patel P, Patel J, Varshney MK. Evaluation of the utility of the Ponseti method of correction of clubfoot deformity in a developing nation. Int Orthop 2008;32:75-9. Jawadi AH. Clubfoot management by the Ponseti technique in Saudi patients. Saudi Med J 2010;31:49-52. Abbas M, Qureshi OA, Jeelani LZ, Azam Q, Khan AQ, Sabir AB. Management of congenital talipes equinovarus by Ponseti technique: A clinical study. J Foot Ankle Surg 2008;47:541-5. Zhao D, Liu J, Zhao L, Wu Z.Relapse of Clubfoot after Treatment with the Ponseti Method and the Function of the Foot Abduction Orthosis. Clin Orthop Surg 2014;6:245-52. Garg S, Porter K. Improved bracing compliance in children with clubfeet using a dynamic orthosis. J Child Orthop 2009;3:271-6. Desai L, Oprescu F, DiMeo A, Morcuende JA. Bracing in the treatment of children with clubfoot: Past, present, and future. Iowa Orthop J 2010;30:15-23. Koureas G, Rampal V, Mascard E, Seringe R, Wicart P. The incidence and treatment of rocker bottom deformity as a complication of the conservative treatment of idiopathic congenital clubfoot. J Bone Joint Surg Br 2008;90:57-60. Maton B, Wicart P. Centrally adaptations in unilateral idiopathic clubfoot children following conservative treatment. J Electromyogr Kinesiol 2005;15:72-82. Ponseti IV, Zhivkov M, Davis N, Sinclair M, Dobbs MB, Morcuende JA. Treatment of the complex idiopathic clubfoot. Clin Orthop Relat Res 2006;451:171-6. Ghali NN, Smith RB, Clayden AD, Silk FF. The results of pantalar reduction in the management of congenital talipes equinovarus. J Bone Joint Surg Br 1983;65:1-7. Bensahel H, Csukonyi Z, Desgrippes Y, Chaumien JP. Surgery in residual clubfoot: One-stage medioposterior release ''a la carte'. J Pediatr Orthop 1987;7:145-8. Phelps AM. The present status of open incision method for talipes equinovarus. Med Res 1890;38:22. Turco VJ. Surgical correction of the resistant club foot. One stage posteromedial release with internal fixation. A preliminary report. J Bone Joint Surg Am 1971;53A: 477-97. Crawford AH, Marxen JL, Osterfeld DL. The Cincinnati incision: A comprehensive approach for surgical procedures of the foot and ankle in childhood. J Bone Joint Surg Am 1982;64:1355-8. Roposch A, Steinwender G, Linhart WE. Implantation of a soft-tissue expander before operation for club foot in children. J Bone Joint Surg Br 1999;81:398-401. Simons GW. Complete subtalar release in club feet. Part II--Comparison with less extensive procedures. J Bone Joint Surg Am 1985;67:1056-65. Lohia LK, Meena S, Kanojia RK. Comparative study of complete subtalar release and Joshi's external stabilization system in the management of neglected and resistant idiopathic clubfoot. Foot Ankle Surg 2014. Graham GP, Dent CM. Dillwyn Evans Operation for Clubfoot. J Bone Joint Surg 1992;74B: 446-8. Lichtblau S. A medial and lateral release operation for club foot. A preliminary report. J Bone Joint Surg Am 1973;55:1377-84. DeRosa GP, Stepro D. Results of posteromedial release for the resistant clubfoot. J Pediatr Orthop 1986;6:590-5. Evans D. Relapse clubfoot. J Bone Joint Surg 1961;43B: 722-33. Lundberg BJ. Early Dwyer operation in talipes equinovarus. Clin Orthop Relat Res 1981:223-7. Herold HZ, Torok G. Surgical correction of neglected club foot in the older child and adult. J Bone Joint Surg Am 1973;55:1385-95. Dekel S, Weissman SL. Osteotomy of the calcaneus and concomitant plantar stripping in children with talipes cavo-varus. J Bone Joint Surg Br 1973;55:802-8. Lloyd-Roberts GC, Swann M, Catterall A. Medial rotational osteotomy for severeresidual deformity in club foot. A preliminary report on a new method of treatment. J Bone Joint Surg Br 1974;56:37-43. Grill F, Frankie J. The Ilizarov for correction of relapsed or neglected clubfoot. J Bone Joint Surg Br 1987;69:593-7. Gupta P1, Bither N.Ilizarov in relapsed clubfoot: A necessary evil? J Pediatr Orthop B 2013;22:589-94. Joshi BB, Laud NS, Warrier S, Kanaji BG, Joshi AP, Dabake H. Treatment of CTEV by Joshi's external stabilization system (JESS). In: Kulkarni GS, editor. Textbook of orthopaedics and trauma. 1 st ed., Vol 4, New Delhi: Jaypee Brothers Medical Publishers; 1999. Suresh S, Ahmed A, Sharma VK. Role of Joshi's external stabilisation system in the management of idiopathic clubfoot. J Orthop Surg (Hong Kong) 2003;11:194-201. Anwar HM, Arun B. Short term results of CTEV with JESS distractor. J Orthopaedics 2004;e3:1.